I believe that telecommuting started to become popular in the twenty first century. This is when computer and Internet technology really started to advance. More people than ever before now own a cell phone. Very powerful computers including laptop computers started to become very affordable and popular for people to own in their own home. High speed broadband Internet became much more affordable and available to many more people than in the past. There was also the desire for more people to be able to spend more time with their family at home than to have to travel to and from work each day. The major advantage for someone to telecommute is the ability to work from home. I do believe that this can be a major advantage for many people. Some people have families with children where they would like to stay close to at home. In this case telecommuting can be a major advantage to them if the job has very flexible hours working in a very relaxing environment at home. Most people that do telecommute every day from home have a separate area in their home away from the rest of their family so that they can focus on their work. I do believe that telecommuting is very popular for stay at home parents. Telecommuting can reduce the amount of money that is spent on gas. With gas prices over three dollars a gallon now in many parts of the country, it might make sense to work from home more often than to drive to work every day. This can really benefit the environment. The life of a person’s car can be extended as well by not driving to work everyday. The telecommuter might be able to focus more doing their work from home then having to deal with the daily office distractions. Telecommuting might also open up the job market for some individuals. The economy in the U.S. is not really doing well right now. Some people might have to look for a telecommuting job online in another state. In the past if someone wanted to work for a company in another state, they more than likely had to relocate to another state. Now they can just work from home anywhere if they were to get hired. Telephones including cell phones, web cams, and video conferencing might be used if the telecommuter has to talk with coworkers and managers in another state. The m ajor disadvantage of telecommuting is that there is no daily social interaction with coworkers and managers. This could make it harder for some telecommuters to get promoted because managers do not see their employees daily. Telecommuters can also sometimes be lonely. The telecommuter has to really be self-motivated to be able to work every day from home because some people consider the home to be a place to relax and not work. Some people might have a hard time separating their work life from their personal life working at home everyday. Telecommuters working from home might be easily distracted from work if they do not have a separate area in their home for work. Telecommuting does have some advantages and disadvantages. 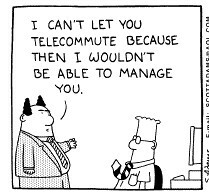 Full time telecommuting is not for everyone. It depends on what the person’s personal situation is at home and what type of job they would prefer to do for a living. I do believe that full time telecommuting is not for someone who is single because they might desire the social interaction with people by going to work every day. A telecommuting job might be more appealing for someone that has a family at home. Personally, I do not believe that I would like or enjoy a full time telecommuting job but I would consider a job with some telecommuting work at home after I am done with college. I would be someone that would enjoy going to work every day and having interaction with my coworkers and managers than someone that just does their work on the computer at home every day. There are many benefits to a job that has some part time telecommuting. I do believe that telecommuting will keep on getting more popular in the future because technology just keeps on advancing.